For well over a hundred years there has been a belief that some kind of process, or dialectic, between or involving certain, particular, opposites might lead us to answer questions such as Quid est Veritas?, could lead to a certain understanding of ourselves, and may well express something of the true nature of reality, of Being itself. In varying degrees this belief is evident, for instance, in Hegel, Nietzsche (with his Wille zur macht), Marx, and those espousing the doctrine that has been termed Social Darwinism. In addition, and for a much greater span of causal Time, this belief has been an essential part of certain religions where the process is often expressed eschatologically and in a conjectured conflict between the abstract opposites of ‘good’ and ‘evil’, God and Devil, and such things as demons and angels. In respect of these two forms, Plato tries to explain that while there are two terms, two distinct namings – πόλεμος and στάσις – what are so denoted are not just two different names but express what he regards as the reality – the being, οὐσία – of two differing contrasted beings; that is, he posits what we would call two different ideations, or abstractions, creating an abstract (idealized) form for one and an abstract (idealized) form for the other. All by genesis is appropriately apportioned [separated into portions] with beings bound together again by enantiodromia . Which might seem to suggest that a certain mis-understanding of Heraclitus . the ideation of Plato and of later philosophers and theologians, was the genesis of abstractions and of this belief that a so-called conflict of opposites can lead to ‘truth’, and explain the nature of Being and beings. However, this ideation, this development of abstractions, and this process of a dialectic, led to the philosophical error of the separation of beings from Being so that instead of the revealing that would answer Quid est Veritas? there is ὕβρις with the numinous authority of an individual πάθει μάθος replaced by adherence to some dogmatic dialectical process involving some assumed struggle/conflict. That is, by considering ἀρχὴ as the cause of the abstractions which are opposites and the origin of a dialectic , and which opposites, and which dialectic involving them, are said to manifest the nature of both our being and of Being itself. This is an error because Πόλεμος is neither kampf nor conflict, but rather – as the quote from Diogenes Laërtius suggests – what lies behind or beyond Phainómenon; that is, non-temporal, non-causal, Being which, though we have have a natural tendency to separate into portions (that is, to perceive beings as only beings), beings themselves become revealed as bound together again by us facing up to the expected contest: that is, to our human nature and to knowing, to developing, to using, our faculty of reasoned judgement – σωφρονεῖν – to uncover, to reveal, via λόγος, the true nature of Δίκα and thus restore ἁρμονίη . σωφρονεῖν ἀρετὴ μεγίστη, καὶ σοφίη ἀληθέα λέγειν καὶ ποιεῖν κατὰ φύσιν ἐπαίοντας. εἰδέναι δὲ χρὴ τὸν πόλεμον ἐόντα ξυνόν, καὶ δίκην ἔριν, καὶ γινόμενα πάντα κατ΄ ἔριν καὶ χρεώμενα [χρεών]. Fragmentum 80. This is generally considered to mean something abstract such as: war is everywhere and strife is justice and all that is arises and passes away because of strife. Thus the suggestion is that Πόλεμος is not some abstract ‘war’ or strife or kampf, but not only that which is or becomes the genesis of beings from Being, but also that which manifests as δίκη and accompanies ἔρις because it is the nature of Πόλεμος that beings, born because of and by ἔρις , can be returned to Being (become bound together – be whole – again). 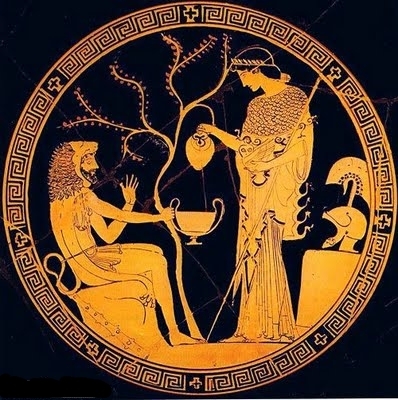 For it is perhaps interesting that in the recounted tales of Greek mythology attributed to Aesop, and in circulation at the time of Heraclitus, a personified πόλεμος (as the δαίμων of kindred strife) married a personified ὕβρις (as the δαίμων of arrogant pride)  and that it was a common folk belief that πόλεμος accompanied ὕβρις – that is, that Polemos followed Hubris around rather than vice versa, causing or bringing ἔρις. As a result of ἔρις, there often arises πάθει μάθος – that practical and personal knowing, that reasoned understanding which, according to Aeschylus  is the new law, the new understanding, given by Zeus to replace the older more religious and dogmatic way of fear and dread, often viewed as Μοῖραι τρίμορφοι μνήμονές τ᾽ Ἐρινύες . A new understanding which Aeschylus saught to explain in the Oresteia. In addition, by cultivating and by using our natural faculty of empathy, which is part of λόγος , we can understand both φύσις and Πόλεμος, and thus apprehend Being as Being, and the nature of beings – and in particular the nature of our being, as mortals. For empathy reveals to us the acausality of Being  and thus how the process of abstraction, involving as it does an imposition of causality and separation upon beings (and the ideation implicit on opposites and dialectic), is a covering-up of Being and of Πόλεμος and thus involves a mis-understanding of both Δίκα and of φύσις. In place of the numinosity of ψυχή – of Life qua being – there is, for the apprehension that is a dialectic of opposites, the hubris of abstractions, and thus a loss of our natural balance, a loss of ἁρμονίη  and συμπάθεια. I have used a transliteration of the compound Greek word – ἐναντιοδρομίας – rather than given a particular translation, since the term enantiodromia in my view suggests the uniqueness of expression of the original, and which original in my view is not adequately, and most certainly not accurately, described by a usual translation such as ‘conflict of opposites’. Rather, what is suggested is ‘confrontational contest’ – that is, by facing up to the expected/planned/inevitable contest. Interestingly, Carl Jung – who was familiar with the sayings of Heraclitus – used the term enantiodromia to describe the emergence of a trait (of character) to offset another trait and so restore a certain psychological balance within the individual. Refer to my (a) The Balance of Physis – Notes on λόγος and ἀληθέα in Heraclitus; (b)Heraclitus – Notes on Fragment 53; (b) Πόλεμος and Δίκη in Heraclitus B80 (forthcoming); (c) Physis, Nature, Concealment, and Natural Change. While Φύσις (Physis) has a natural tendency to become covered up (Heraclitus, Fragment 123) it can be uncovered through λόγος and πάθει μάθος. Πόλεμος πάντων μὲν πατήρ ἐστι, πάντων δὲ βασιλεύς, καὶ τοὺς μὲν θεοὺς ἔδειξε τοὺς δὲ ἀνθρώπους, τοὺς μὲν δούλους ἐποίησε τοὺς δὲ ἐλευθέρους. Fragmentum 53. See my Heraclitus – Notes on Fragment 53, and my Πόλεμος and Δίκη in Heraclitus B80. In the former article, I suggest a new interpretation of Fragmentum 53: Polemos our genesis, governing us all to bring forth some gods, some mortal beings with some unfettered yet others kept bound. I have deliberately transliterated (instead of translated) polemos, and left δίκη as δίκη. In respect of δίκη, see my essay Quid Est Veritas? One should be aware that polemos pervades; with discord δίκη, and that all beings are begotten because of discord. Correctly understood, a δαίμων is not one of the pantheon of major Greek gods – θεοί – but rather a lesser type of divinity who might be assigned by those gods to bring good fortune or misfortune to human beings and/or watch over certain human beings and especially particular numinous (sacred) places. In addition, Polemos was originally the δαίμων of kindred strife, whether familial, or of one’s πόλις (one’s clan and their places of dwelling). Thus, to describe Polemos, as is sometimes done, as the god of conflict (or war), is doubly incorrect. It is interesting to observe how the term δαίμων – with and after Plato, and especially by its (mis) use by the early Christian Church – came to be a moral abstraction, used in a bad sense (as ‘demon’), and contrasted with another moral abstraction, that of ‘angels’. Indeed, this process – this change – with this particular term is a reasonable metaphor for what we may call the manufacture and development of abstractions, and in which development the ontology and theology of an organized monotheistic religion played a not insignificant part. As mentioned in my Pre-Socratic Philosophy, The Numinous Way, Aesthetics, and Other Questions, λόγος is manifest to us in both empathy and reason. qv. Some Notes Concerning Causality, Ethics, and Acausal Knowing.